Day 18 of the 2012 World Series of Poker had five tournaments playing out around the Rio, with most of the attention on Phil Ivey’s third attempt this year for a ninth bracelet. Ivey fell short, but two other big names battled until the wee hours of the morning when play was suspended. They will be returning to finish the final table on Thursday. There was also a bracelet to be won in Event #23, one event playing down to its final table, another playing down to the final two tables, and one getting under way with a star-studded field. Over three days, Event #23 played down from a starting field of 924, to the 141 who moved on to Day 2, to the final 18 who began the third and final day. In the end, Canadian Simon Charette emerged from that field to become the newest owner of a 2012 WSOP gold bracelet, along with first-place money of $567,624. The chip leader going into the final day was Artem Metalidi with 1,523,000, but poker heavyweights Eugene Katchalov, Betrand “ElkY” Grospellier, Freddy Deeb, Andrew Lichtenberger, and 2008 Novemember Niner Scott Montgomery were among those still in contention. It looked to be a short day of play, with six eliminations occurring within the first hour of play. Katchalov was one of the early players to be knocked out when he shoved his short stack with and was up against Eddie Blumenthal’s . Katchalov paired his queen, but Blumenthal rivered a pair of aces, and Katchalov was out in 17th place. Montgomery was the final table bubble boy. Short-stacked, he raised preflop and had one caller in Simon Charette on the button. After the flop came , Montgomery moved all-in. Charette called and Montgomery showed for a flush draw, while Charette had for top pair. The turn gave Montgomery additional outs, but the river missed him and he was out in seventh for $49,124. The biggest name left in the field, Grospellier, was out next in sixth place. In his final hand, Luis Rodriguez Cruz opened to 41,000 from under-the-gun and action folded over to Grospellier in the cutoff, who went all-in for his last 260,000. Artem Metalidi tank-called from the small blind. The rest folded and hands were revealed. Grospellier had a slight lead with to the of his opponent. Unfortunately for him, the board ran out , which paired Metalidi's king and sent Grospellier to the rail in sixth place for $68,738. The remaining five battled it out for three hours, before we saw the next player eliminated. Foster Hays went all-in from the small blind for his last 305,000. Metalidi called from the big blind and cards in the air, Hays was way behind, to . The board ran out uneventfully, , and Hays was heading to the rail in fifth place for $98,756. It took over an hour for the next player to exit the final table. It started when Charette put out a standard raise of 100,000 from under the gun. Cruz was next to act and three-bet to 230,000 from the button. Blumenthal four-bet to 620,000 from the small blind, Metalidi folded the big blind and Charette moved all-in. Cruz folded, and Blumenthal made the call and was at risk and well behind to . Blumentahl could not improve and he was out in fourth for $146,053. Meanwhile, Charette picked up the biggest pot of the night. Charette moved further ahead when he eliminated Cruz in third place, versus pocket sixes, when he caught an on the river. He finished his run over the table knocking out Metalidi next. For his final hand, it was Charette with the sixes, his opponent with an ace, but the board blanked and Metalidi was out in second place, for $350,806. Not bad for the Ukranian’s first WSOP cash. With this win, Simon Charette surpassed his previous best WSOP finish, when he came in second in one of the $1,500 NLHE events last year. Charette has his first WSOP bracelet in his first cash of 2012, a tidy $567,624. To relive all the exciting final day action, make sure you check out our live reporting blog. With one famous Phil already nabbing a gold bracelet this year, there was great interest in this event as Phil Ivey led the field of 27 moving on to the third and final day. But he wasn’t the only player who attracted attention as he was joined at the same table by two of the game’s most interesting players — Mike Matusow, who had overcome a bout of food poisoning on Day 2, and Scotty Nguyen. Meanwhile, Joe Cassidy, Brian Hastings, Dan Kelly, Brendan Taylor, Bart Hanson and Mike Wattel were among some of the other notables battling it out at the other two tables. After 13 grueling hours, the winner was still yet to be decided. Two remained, Cassidy and Nguyen, after Ivey fell two spots short of his goal. Play was suspended when the two could not agree to continue and they bagged up their chips for the night. They will return on Thursday at 1400 PDT (2200 BST) for the heads-up match, with Cassidy having a 3.5:1 chip advantage over Nguyen. Let’s look back at how we got to heads-up. It only took two hours for 27 to become 18 and during that time Ivey maintained his position atop the leaderboard. Hastings was sitting on the third-biggest chip stack, but his hopes of a second bracelet this summer ended, as he tweeted not an hour later, “Busto 16th. Running bad vs world class players is a deadly combo.” Kelly delivered the knockout punch, versus the of Hastings, when the board ran out giving Kelly a flush. With the elimination of Andreas Krause in 10th place at just before 1900 PDT (0100 BST), we had our official final table which was broadcast live via WSOP.com. The final nine was an illustrious group, boasting 17 gold bracelets among them. Chip leader going into the final table with 940,000 was Joe Cassidy, earning his 13th WSOP cash and going for his first gold bracelets. Ivey was close behind him with 890,000. Sitting to Ivey’s left was Nguyen, with 324,000, arguably the best Omaha/8 player in the field. Hanson was the short stack with 96,000. Matusow had not much more, coming in with just 133,000. Ryan Lenaghan, who made a deep run in last year’s Main Event, was also in the field with a below-average stack of 254,000. Online Omaha/8 specialist Elie Doft (311,000), Meng La (518,000) and Gregory Jamison (376,000) rounded out the table. Limits were 12,000/24,000 at the beginning of the final table. Lenaghan was the first eliminated from the final table at the hands of Jamison. Lenaghan raised from middle position and both Jamison, in the hijack, and Phil Ivey, in the big blind, called. After the flop came , Ivey checked, Lenaghan put out his final 12,000 chips, Jamison raised it to 27,000 and after Ivey folded, Lenaghan was heads up for his tournament life. He had and Jamison had . The turn was the and the river the giving Jamison the pot with a Broadway straight. Lenaghan said goodbye to his chips and left the final table area. He took home $26,940. Hanson should have been the next one out when his opponent flopped the nut flush on him when he was all-in, but Hanson turned a full house and, with no qualifying low, he stayed alive. Not as fortunate was Matusow, who exited right after the dinner break. Extremely low on chips, he went all-in with his final 15,000 chips from under-the-gun-plus-one. La raised it up from the hijack and both Ivey and Nguyen called out of the blinds. Ivey checked the flop. Nguyen bet and both Both La and Ivey called, giving us three-way side pot action on the turn. The turn was the and Ivey led out for 40,000. Nguyen put in a raise to 80,000 and La threw his hand into the muck. At this point Ivey put in the third bet making it 120,000 to go. Nguyen called. The river was the and Nguyen called another one of Ivey's bets. Ivey showed for the nut low while Nguyen turned over for the high. Matusow turned over his and that was no good to get hold of any part of the pot. Matusow collected $34,748 for his eighth-place finish. Hanson was next out, in seventh place. He went in with and had one caller in Ivey with . Board ran out and Hanson followed Matusow to the exit, collecting $45,084. Doft was the next to hit the rail after raising all-in for his last 40,000 and getting called by Cassidy out of the big blind. Doft turned over and was up against . The board ran out giving Cassidy the win and sending Doft to collect his $58,873 payout. Jamison was eliminated next, after putting all of his chips in with the board showing against Joe Cassidy. Cassidy called Jamison’s river all-in bet then showed and his nut flush scooped the pot. Jamison showed his before he left to pick up his fifth place prize money of $77,342. La had survived a few all-ins, but finally his run for the gold ended in fourth place. In his final hand, La raised to 50,000 from the small blind and Joe Cassidy defended his big blind. The flop came down and Cassidy called La's continuation bet. The turn was the and La moved all-in. Cassidy called and showed . La turned over and there was no card on the river that would help him beat Cassidy’s flush. But for his long run in this event, La takes home $102,260. Three-handed, limits were up to 30,000/60,000. Cassidy, courtesy of his back-to-back-to-back knockouts was the chip leader with about 1.6 million. Ivey was in second with just under 1.4 million and Nguyen was sitting on about 840,000. Ivey and Cassidy alternated for the top spot, while Nguyen never managed to move higher than second. But after the last break of the night, Ivey’s fortunes turned. He lost a number of hands in quick succession and was down to under one big bet, but he battled back to stay in it. His rebound was nothing short of miraculous. He caught runner-runner against Nguyen to turn a loser into a chopped pot. Then Ivey was at risk again with the flop showing flop. He held the and looked to be the loser against Cassidy's . But the turn was the and river the , giving Ivey a full house. In a rare show of emotion, Ivey exclaimed "Oh my God! Oh my God!" after the hand. But Ivey could not keep up the momentum. On his final hand, he was all-in after a flop with the for two pair — queens and eights. Cassidy had . The turn kept Ivey in front, but the river counterfeited Ivey's hand and left Cassidy with the better two pair — kings and jacks. 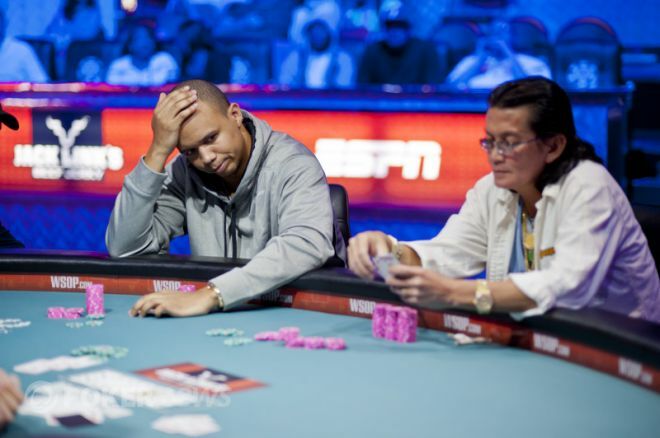 Ivey was eliminated in third place and took home $136,046. Cassidy was up for finishing the match, but Nguyen did not agree and so play was suspended for the night. The two will finish what they started on Thursday, with Cassidy going for his first bracelet after fifteen WSOP cashes and Nguyen going for his sixth, the first since his controversial win in the $50K H.O.R.S.E. event. The limits will be 50,000/100,000, and Cassidy will have 3 million chips to Nguyen’s 840,000, when play resumes. See all the exciting day three action and watch the heads-up match by following out PokerNews live reporting blog. Day 2 began with the 50 players who had won their tables on Tuesday. They were spread out over the remaining 10 tables and the room was filled with notables including Victor Ramdin, Scott Seiver, Greg Mueller, J.J. Liu, Mike Leah, Justin Bonomo, Ari Engel, and Brock Parker. By the time the last table wrapped up, 10 players were left. They will return on Thursday to play down to one winner who will take home $116,118 and the gold bracelet. Brian Meinders was the first player to make it to the final table. He started his heads-up battle with a big chip lead over Chad Layne and never looked back as he railed his opponent fairly early in the day. Sean Rice was the next to advance when he bested Harry Bolger heads up after having a massive chip lead going into heads up. Matthew Schreiber was the next to take his chip lead in heads-up play all the way to a victory against his opponent,Michael Reed. Christopher Vitch took out Tom Koral after building up a huge chip lead against him. Koral got his short-stack in preflop with and he was up against Vitch's . Koral had a glimmer of hope as the door card showed the , but the good news was short-lived as he rest of the flop came , pairing Vitch's top card. The board ran out and Vitch was moving on. Brock Parker prevailed over his heads-up opponent Brandon Meyers to make it through to the final table. Meyers committed the rest of his chips with the board reading . Hands reveal, Meyers was behind with to the of his opponent. Meyers needed a club to survive and when the hit the river, he was heading out and Parker was heading to the final table. After a grueling heads-up match, Victor Ramdin defeated Justin Bonomo to move on. Ramdin had Bonomo against the ropes several times, but Bonomo just refused to go quietly into the good night. Bonomo was able to river a king twice against Ramdin, both times when Ramdin had pocket pairs. We caught the instance where Ramdin held earlier in the blog and Ramdin told us it happened again when he held pocket tens. During the final hand, the two players got it all-in preflop. Ramdin was slightly ahead holding the against Bonomo's . Bonomo failed to improve and Ramdin was able to lock down a seat at tomorrow's final table. Preston Derden moved on to the final table after defeating Millie Shiu heads up. Derden was able to overcome a large chip deficit and come back to defeat Shiu. On the final hand, Shiu got it all-in blind and Derden called blind as well. Shiu had and Derden had . The board ran out and Derden's two pair was good enough to take it down. Christopher Hartman was next to secure a spot at the final table of 10. Hartman overcame Blake Cahail heads-up to take the eighth spot. Darin Thomas and Ian Johns were the last two to win their respective tables, and our final ten players were set. The winners of the ten tables today will return at 1300 PDT (2100 BST) on Thursday to see who can win their third straight table and take home the top prize and the gold bracelet. To make sure you don’t miss out on any of the day two action, check out our live reporting blog. Out of the 589 who entered this event on Tuesday, just 138 moved on to Day 2. Over half of the returning group would be going home without cashing in this event, as only the top 63 would finish in the money. Chip leader going into Day 2 was Joseph Ressler with 122,100 chips. Matt Perrins, Scott Clements, Chance Kornuth, John Racener, Tex Barch, Nacho Barbero and Robert Williamson III were among those still in the hunt for the gold bracelet. The first order of business on Wednesday was getting into the money. The unfortunate bubble boy was Chance Kornuth who was all-in after the flop. Galen Kester called him and showed . Kornuth was behind with and failed to improve after the turn and river. Finishing in the money, but not moving on to day three, were Shawn Buchanan, Tex Barch, Isaac Haxton, Matt Vengrin, Padraig Parkinson, and Ted Lawson. Last year’s winner Sam Stein could not repeat, and ended up eliminated in 35th place for $8,812. Chino Rheem had a day he'd probably like to forget. Rheem had it all-in twice with pocket aces versus pocket kings and twice was out-flopped and couldn't catch back up. Having a better day was Erik Seidel. After being short stacked for most of the day, he managed to hang on and will be returning on Thursday, albeit with the second smallest stack, courtesy of a late in the day double-up. By the time the chips were bagged and tagged, there were just 18 players remaining. Chip leader going into the final day will be Vadzim Kursevich with 741,000 chips. Returning as well will be Oleksii Kovalchuk and Brett Richey (each of whom had delivered a bad beat on Rheem), Robert Williamson III, Dutch Boyd, John Racener and Seidel. Action will return at 1400 PDT (2200 BST) Thursday with players attempting to play down to a winner. Follow all of the exciting Pot-Limit Omaha action by checking out our live reporting blog for constant updates. Event #27 drew 889 runners, creating a prize pool of $1,200,150. The top 96 players will cash, guaranteed a minimum payout of $2,676 up to the top prize of $267,081. By the end of ten levels of play, 165 were left in the field. On Thursday, they will play down first to the money bubble, and then to the completion of ten more levels of play. H.O.R.S.E. brings out the notables as well as the masochists who revel in alternating between hold’em, Omaha-8, razz, stud and stud-8. Mike Sexton, Joseph Cheong, Jeff Madsen, Scott Fischman, John Juanda, Carlos Mortensen, Marsha Waggoner, Scott Seiver, Bill Chen, Joe Serock, Maria Ho, Karina Jett, Matt Hawrilenko, and James Van Alstyne are just some of the players who were unable to make it out of Day 1. Last year’s winner, Aaron Steury, was eliminated near the end of the day when his 8-7-6-5-4 no match for his opponent’s 6-4-3-2-A. Gavin Smith was within minutes of returning for Day 2, but during a hand of razz he couldn’t beat the 8-6-5-4-3 low of former main event champ Huck Seed. Chip leader going into day two will be Karle “Skip” Wilson, with 74,900. There are still quite a few big name players vying for the gold. Those with above-average chip stacks include Daniel Idema, Justin Young, Allen Cunningham, Yuval Bronshtein, Seed, Chip Jett, David Williams, John Monnette, Rep Porter, Christian Harder, David Sklansky, and Eli Elezra. Follow all of the exciting pot-limit Omaha action by checking out our live reporting blog open for constant updates. On Thursday, the suspended final table in Event #24: $5,000 Omaha Hi-Low Split 8-or-Better will resume at 1400 PDT (2200 BST). Event #25: $1,500 Limit Hold'em Shootout will play down to a winner, starting at 1300 PDT (2100 BST). Event #26: $3,000 Pot-Limit Omaha is scheduled to play down from 18 players to a winner with the action beginning at 1400 PDT (2200 BST). In Event #27: $1,500 H.O.R.S.E. , 165 players will return at 1300 PDT (2100 BST) and play 10 levels or down to the final table, whichever comes first. Finally, Event 28: $2,500 No-Limit Hold'em — Four-Handed will get under way at 1200 PDT (2000 BST). Lynn Gilmartin talks with Bertrand “ElkY” Grospellier during his run in the $3K 6-Handed event. They discuss the wild table he was at, his workout routine during the series, and his position atop the Global Poker Index. Want more videos from the 2012 World Series of Poker? Check out the PokerNews Video page for interviews with your favorite players, and more.